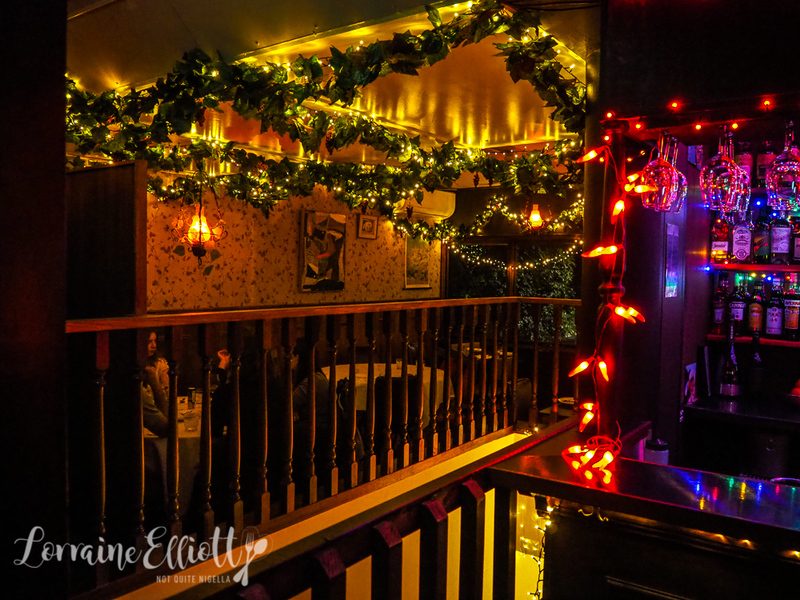 Ron's Upstairs on Redfern Street in Redfern is a kitsch joint decorated with fairy lights, faux grape vines, an entrance that looks like it belongs to an adult book store and a menu of solid hits. 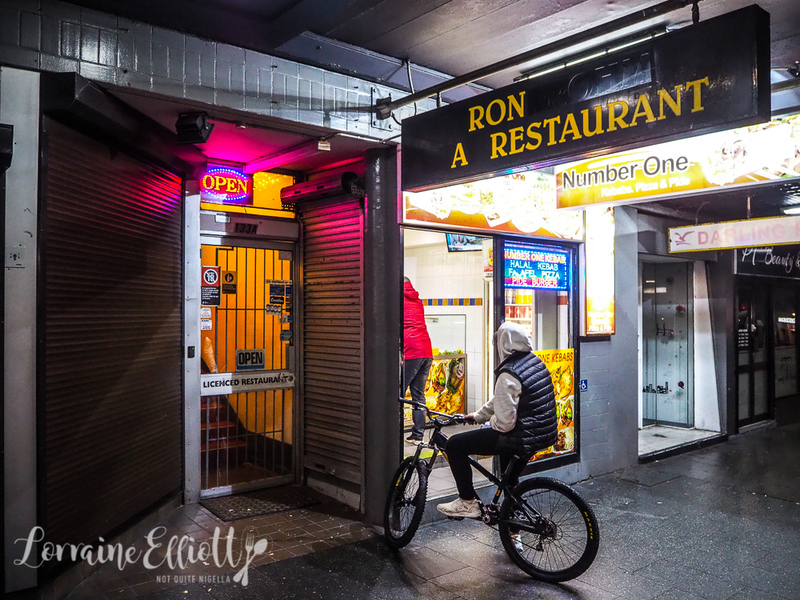 If you're wondering what the original sign says, the one where letters are plastered over, it used to say Pron Prohm, a Thai restaurant that survived in Sydney for thirty years. Ron's upstairs is by the same people from Redfern Continental across the road. They've kept the retro outfitting but highlighted it with vintage posters. "I expected to see Ron Swanson here," says Viggo. 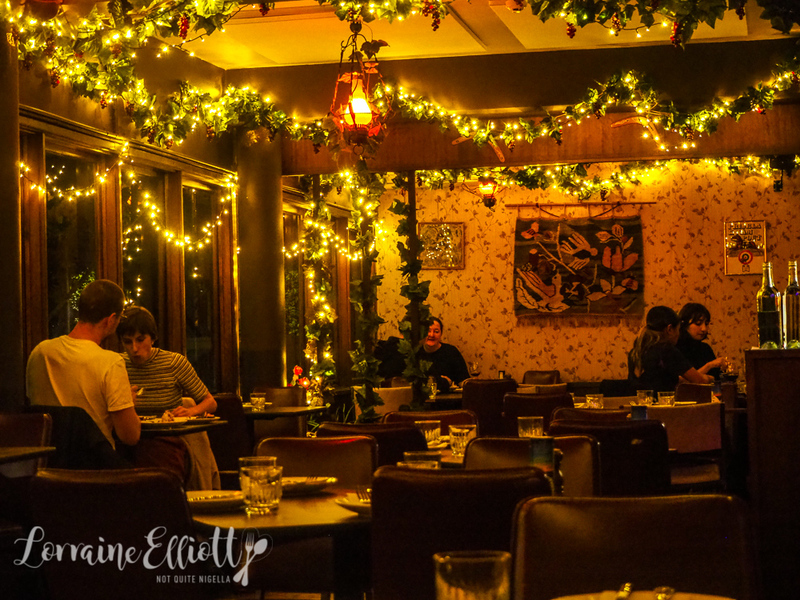 The menu is described as Mediterranean style and despite the setting, which reminds me of a 70's lounge room, it is also quite contemporary with influences from many countries. Service from the all female floor team is friendly and welcoming. 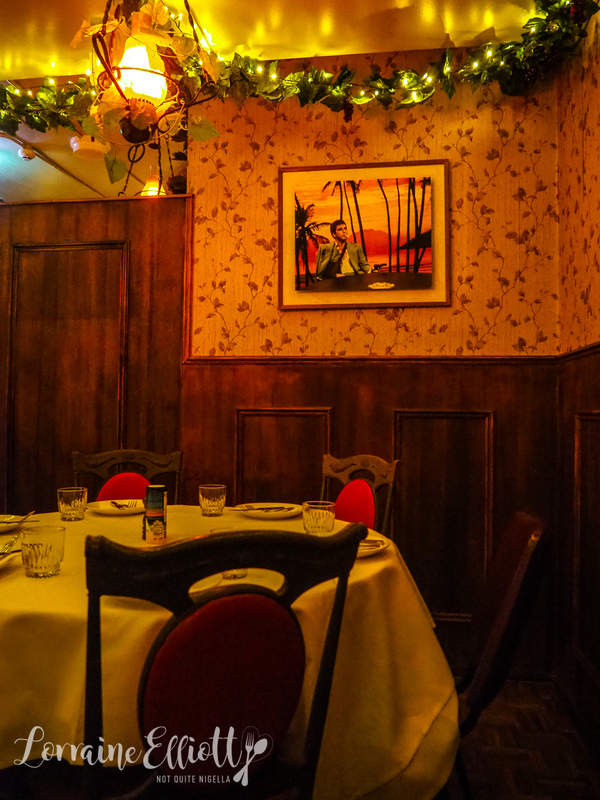 There are plenty of share plates and a section of four mains from the rotisserie which is run by chef Damir Mujanic. Louise and Viggo have baby Henry and there is no high chair so they take turns with him on their laps. 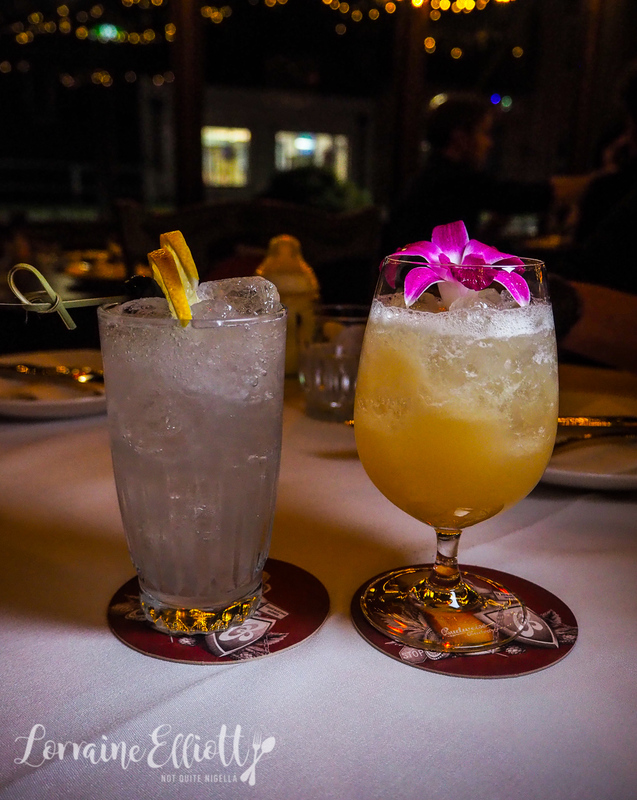 We order, a Rosewater Lemonade cocktail for her and a Ron's My Thai cocktail for Mr NQN. We're not overly smitten with the cocktails, there's a lot of crushed ice and the flavours are quite sharp and not as nuanced as we had hoped. We have much better luck with the food. The entrees all land at once and it's a feast for the eyes as well as the grumbling tummies. 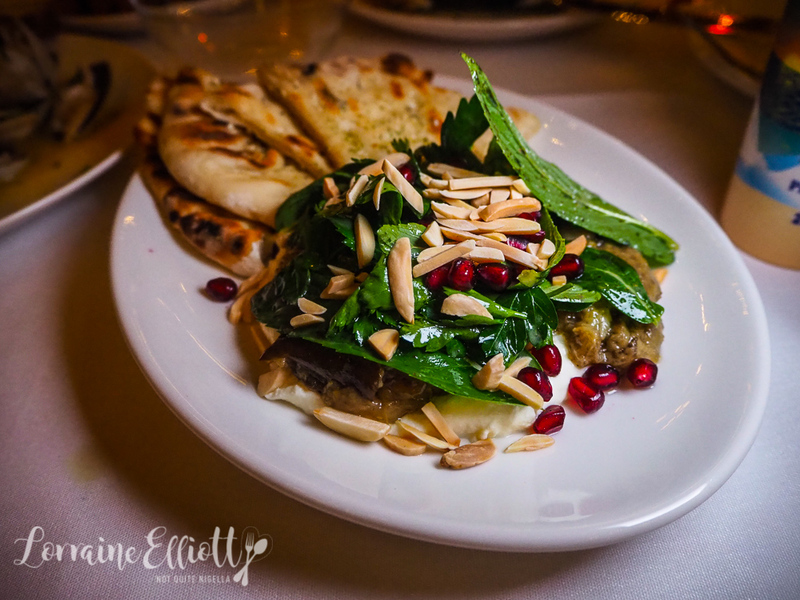 The eggplant, labne, almonds, pomegranate and flat bread is a delightful dip and bread combination, especially with the toasted slivered almonds, pops of pomegranate and fresh parsley on top. 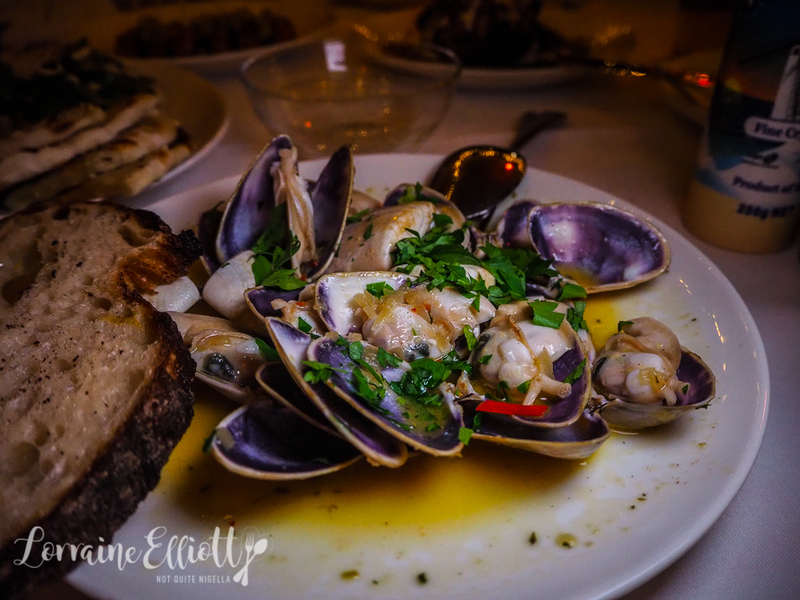 My favourite entree is the pipis with a divine white wine and burnt butter sauce. There's just one slice of Iggy's bread (tip: order more, at $2 a slice you need it for that sauce). 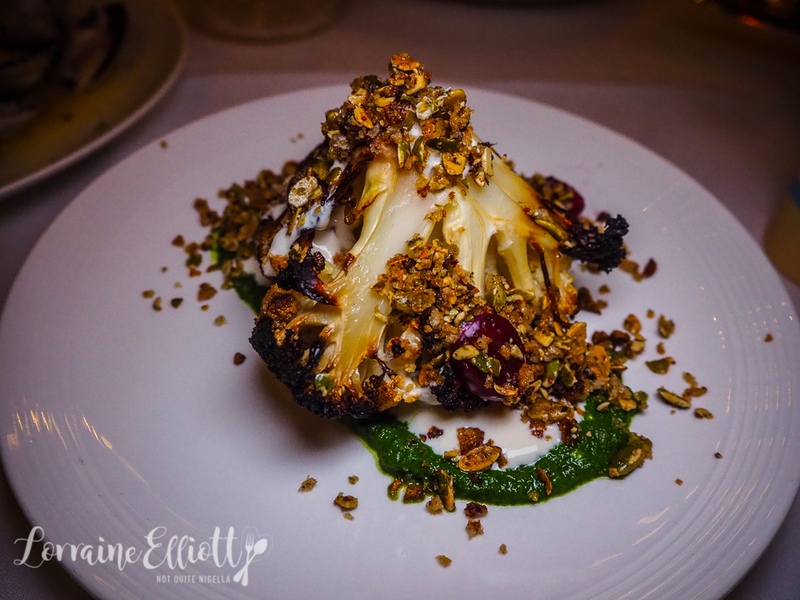 The roasted cauliflower comes burnt at the edges with a tahini yogurt, skhug, a herby green Yemeni Jewish hot sauce and crunchy pangrattato crumbs. This has great fresh flavours from the skhug. 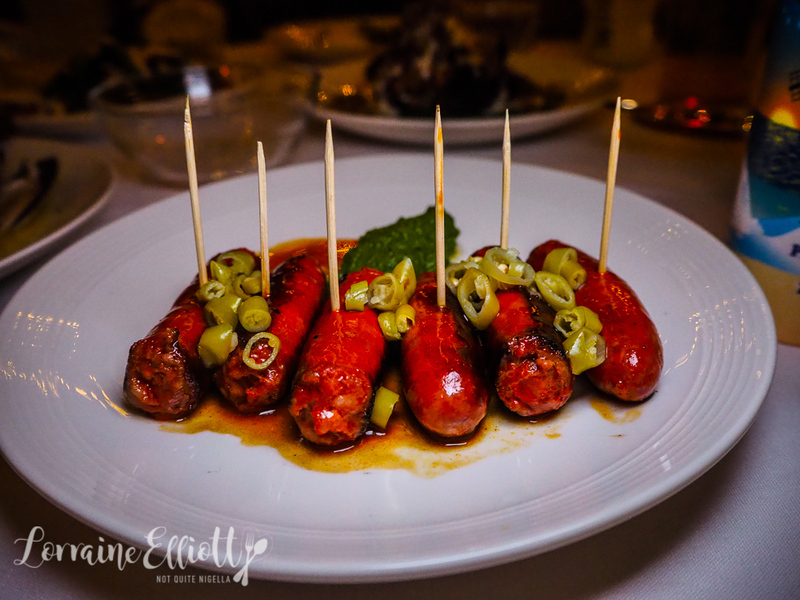 The presentation of spicy little Chistorra sausages (a fast cured sausage similar to chorizo) and looks like a nod to the 70's where everything seemed to be served on toothpicks. It comes cooked in a cider sauce with sliced, pickled guindilla peppers and skhug. Chicken is not often a highlight when I eat out, we rarely order it but this is the house specialty and our vegetarian waitress tells us that it is the most popular dish. It's a spicy paprika rubbed chicken served blistered and charred from the rotisserie served with a fresh chilli sauce and garlicky toum. 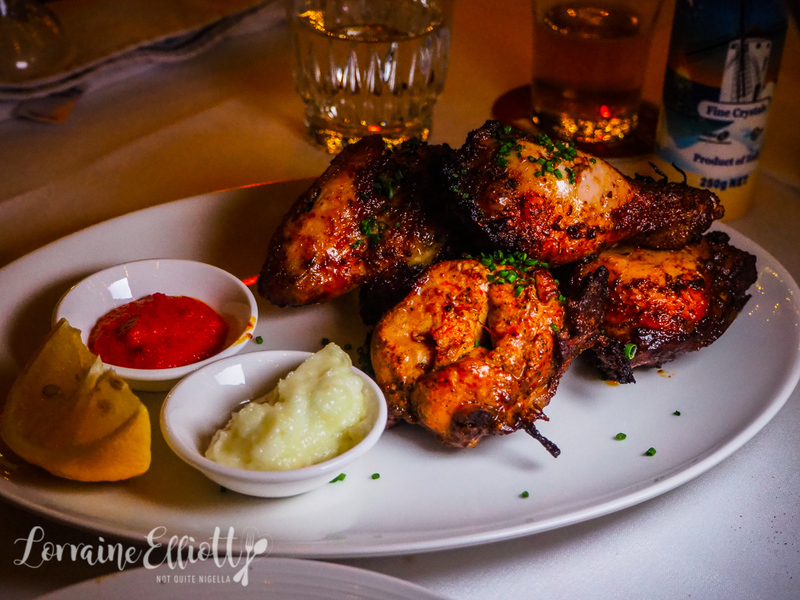 The juicy chicken meat and skin are utterly moreish especially when paired with the chilli sauce and toum. 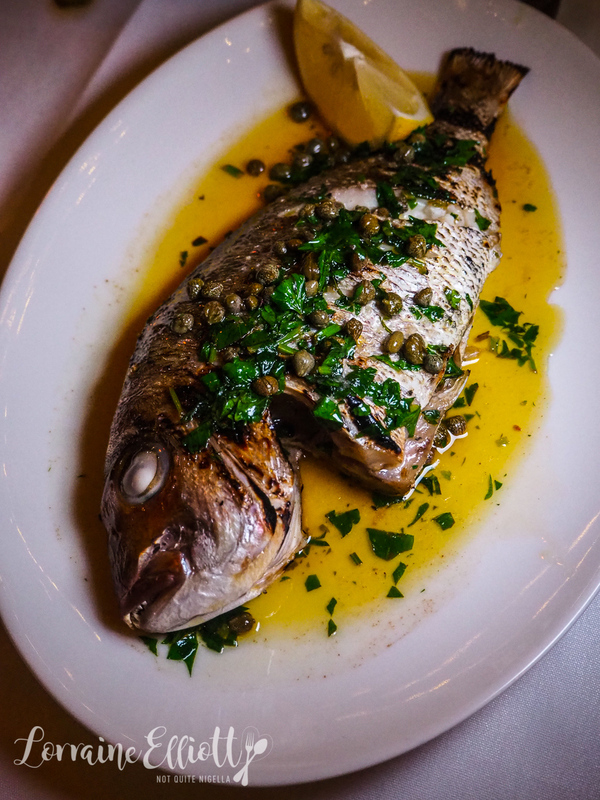 This whole snapper is simple is perfectly done with a caper browned butter sauce. Even Mr NQN and Louise who dislike cooked fish help themselves to several serves of this. 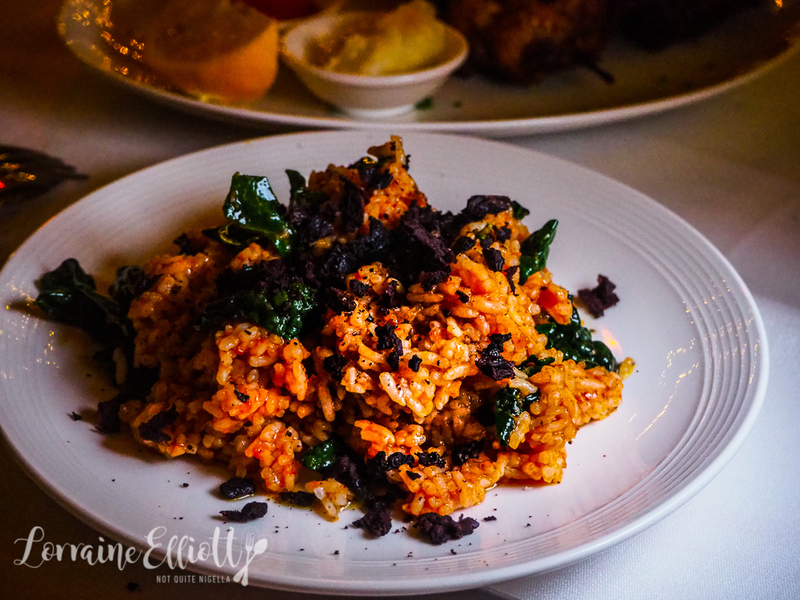 For a side, we decided to skip the crispy potatoes (slight regret there) and go for the tomato rice which is nice and soaks up the browned butter of the fish well. The tomato rice looks to be made Vietnamese style with broken rice but here it is served with bitter greens. There are three choices for dessert and we decide to share a couple of them as we are quite full. 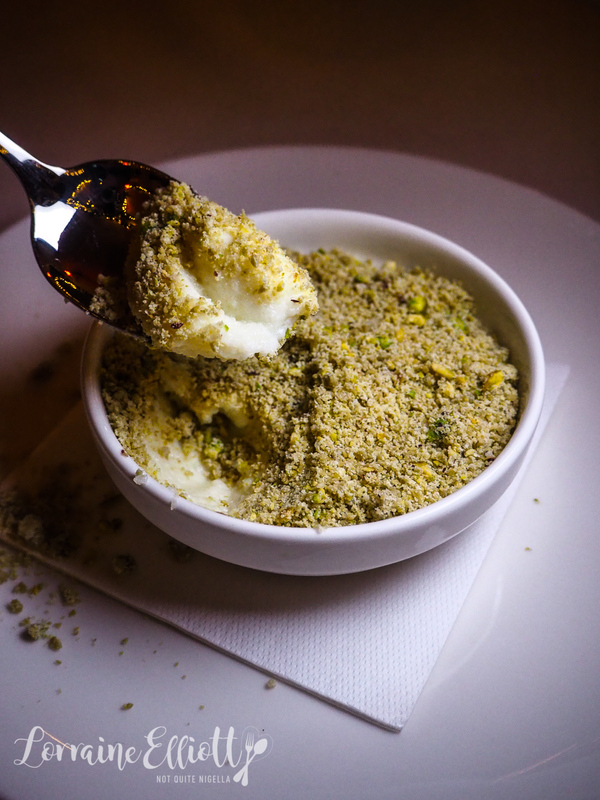 The first is a semolina crema with a topping of pistachio and tahini snow on top. It's sweet but quite bland and I think some acidity or fruit would really help. The doughnuts are better (although we would have loved to know that there were only 3 to a serve as we have 4 avowed donuts lovers). 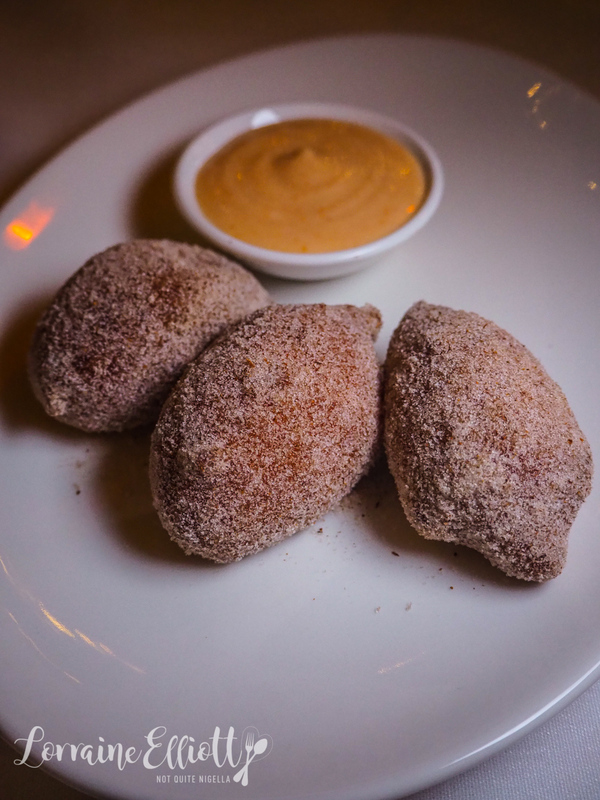 The ricotta doughnuts are freshly fried and rolled in cinnamon sugar with a little pot of blood orange curd to the side. So tell me Dear Reader, do you often order chicken when eating out? And are you a donut fanatic? What do you think of the decor?